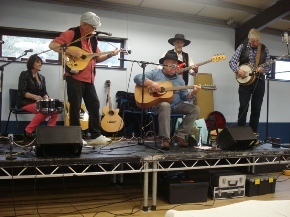 ﻿ Birch Hill Charity Folk Festival 2015 - What's on? We’ve had Daria’s group, Kara as guests at the club, but Daria’s been making something of a name for herself as a solo performer. Since launching her first cd on 31st January, it’s been Album of the Month for January for Folkwords, Artist of the Week on Sunday Girl (Siren 107.3FM), Most Requested Album of the Month for February on The DRSB Show and Album of the Week for Blues & Roots Radio, Fatea Magazine’s Along the Tracks and Marlow FM. Not bad in a couple of months! We liked her and she’s agreed to perform for us. Datchet Border Morris have been performing for more than five decades (not necessarily with the same cast!). Border Morris comes from the counties bordering on Wales and the black faces and rags are believed o have evolved to preserve the anonymity of men performing an annual ritual dance to bring fertility to the land each spring. Nothing to worry about girls! 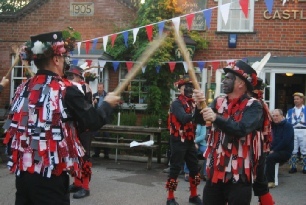 This Morris side perform with a verve and gusto sure to raise a thirst! Hilary describes herself as a “story singer”. 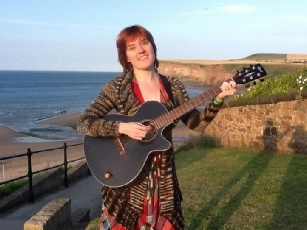 She has a rich fund of traditional and more recent songs to draw on and knows how to present them as she has done in the past both at this festival and at the club. 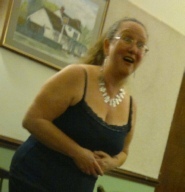 Not surprisingly, she has a full list of bookings ahead, but has agreed to sing for us at our festival. 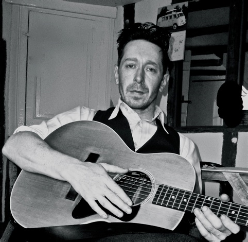 Despite insisting on playing his guitar back-to-front, John’s a talented and popular performer with a style all his own. 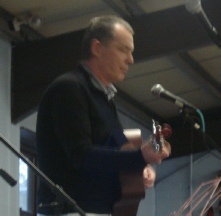 He’s performed at this festival before as well as at Bracknell Folk Club and Anchor Folk Club and includes an eclectic mix of songs mostly written in the last hundred years rather than traditional. He even knows who wrote most of them! Jim’s popular in clubs throughout the area, so no apologies for managing to book him again. He’s a crowd-puller and a crowd-pleaser. He’s been a guest at the club a couple of times and was our headline act at our last festival in 2013. It’s always a delight to be present at his performances, so we’re looking forward to this next chance. This a new band on the scene consisting of Mike Peach , Louise, Morag, Bernie Dembowski & Martin Wayne. Mike recommended them! Skip reached no. 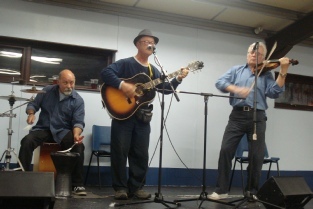 1 in the UK Blues Charts in summer 2010, is an All Ireland champion in the grupai cheoil and was our guest at the club in June, 2014. 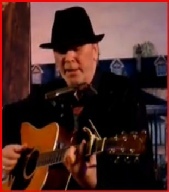 He’s a man for whom the blues seems to run in his veins and he has a significant portfolio of self-penned songs to draw on. He’s agreed to come over from the far east (East Anglia), doubtless swapping his camel for a car en route, to the depths of Birch Hill. This group have been our guests at the club and at previous festivals and have had a busy year so far with a range of bookings. Ade has a very English and tongue-in-cheek take on the blues with a sense of humour and parody included at no extra charge. 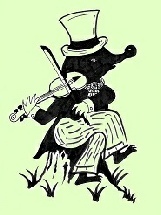 Brilliantly backed by violin, percussion and guitar, they’re always good entertainment. 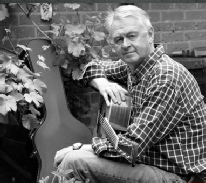 Steve is a singer of both traditional and self-penned songs who’s fine singing voice and enjoyment of performing makes any audience want to join in the choruses. Steve already had another gig earlier in the day, but agreed to make the cross-country dash to perform for us. 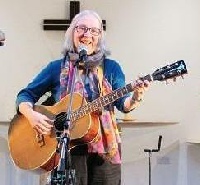 Sue is well-known as both a solo singer and a singer with the group, Soiree Her honeyed voice has charmed the socks off of may a seasoned folkie who then left her singing cold-foot (the opposite of leaving hot-foot). Just when you thought it was safe to nod off, this sextet are guaranteed to wake you up! With blues, folk rock, country, bluegrass and more than a hint of big band jazz, you can never be sure what’s next, but it’s always entertaining. We’re pleased to be able to welcome them to our festival again. Open mic - a cornucopia of floor spots!